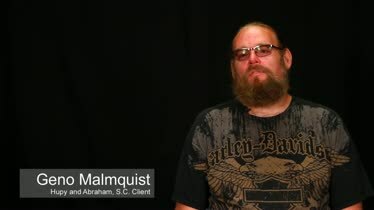 IL Motorcycle Accident Attorney | Bike Crash Lawyer in IL | Hupy and Abraham, S.C.
Illinois motorcycle crashes took the lives of 132 motorcycle drivers and 11 motorcycle passengers during 2015, according to the Illinois Department of Transportation. Many more were injured. Those who were hurt, those who died, and those who lost a loved one had their lives forever changed by an accident that could have been preventable. 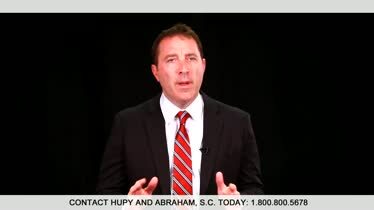 As avid riders and experienced motorcycle accident lawyers, the attorneys of Hupy and Abraham understand the true cost of a motorcycle accident and we are committed to helping those who have been hurt recover the fair damages they deserve. We believe that recovering fair damages starts with understanding the motorcycle accident recovery process as well as the insurance companies do. You can get started right now by reading our FREE book, The Ultimate Guide for Motorcycle Accident Victims, and browsing our website. Brain and head injuries. Skull fractures, open head injuries, and traumatic brain injuries can occur when a rider’s head collides with the pavement, a vehicle, or another object. Spinal cord injuries. Spinal cord injuries can result in paralysis and other permanent disabilities. The specific injury that is suffered depends on the part of the spinal cord that was hurt in the motorcycle accident. Broken bones. Any bone in the body may be broken if a rider is thrown from his bike, if his bike lands on top of him, or in another way during a crash. Necessary medical attention and a prognosis is dependent on the severity of the break and the specific bone broken. rider’s arm. rider’s arm is a form of nerve damage that can occur during an accident. In severe cases, this nerve damage is permanent. Chest injuries. 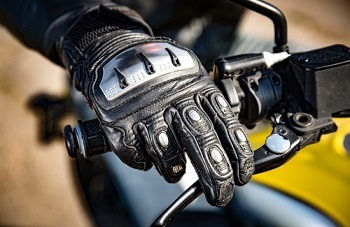 If your chest is penetrated or crushed in a motorcycle accident, then there could be significant and potentially fatal injuries to your organs such as your heart or lungs. Eye injuries. Permanent vision changes and significant pain may occur if the eye is injured in a bike wreck. Open wounds. Infection and scarring are significant risks for riders who suffer open wounds during a bike crash. Road rash. A rider who hits the ground forcefully or is dragged along the asphalt may suffer significant scrapes. This is known as road rash. Road rash may become infected and it may leave lasting scars. Facial and dental injuries. The pain, expense, and trauma can be significant any time a facial bone is broken or a wound occurs. Amputations. Amputations may occur in the hospital after a motorcycle crash if an infection occurs in a wound or doctors cannot repair the damage done in the crash. In rarer cases, an amputation may occur if an arm, hand, finger, leg, foot or toe is severed during the crash. Death. Many of the injuries described above can be fatal. It is important to get prompt medical attention for an accurate diagnosis of your motorcycle accident injury. T-bone crash. A t-bone crash is a type of side impact crash that usually occurs when a vehicle fails to stop at an intersection and hits the side of the motorcycle that is lawfully proceeding through the intersection. Rear-end accident. When a car follows a motorcycle too closely or fails to stop when the motorcyclist stops, then the car could hit the bike from the back and cause a rear-end crash. Head-on collision. When one vehicle is in the wrong lane, the front of that vehicle may collide with the motorcycle that is traveling lawfully in its own lane. Left turn accident. Drivers often think riders are farther away than they really are because of the bike’s small size. Accordingly, they may try to make a left turn when they do not have enough time to do so safely—and the rider may collide with the side of their vehicle. Aggressive drivers. A driver who is weaving in and out of traffic or who is following a motorcycle too closely can cause a serious collision. Speeding drivers. A speeding driver may be unable to avoid a collision with a motorcyclist. Drowsy drivers. A car driver who is tired may have slower reaction times and impaired judgment that causes serious motorcycle wrecks. Distracted drivers. Texting, talking on the phone, eating, changing music, talking to passengers and a host of other distractions can take a driver’s attention away from watching for motorcycles. 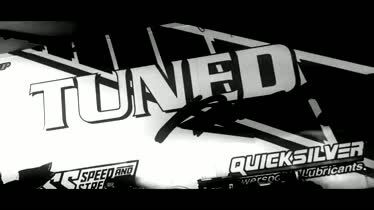 In less than a second a serious crash can occur. Mistakes made by car drivers. Car drivers are used to looking for cars and trucks, but may fail to watch for motorcyclists. Even when they do see motorcyclists, car drivers may fail to account for the smaller size of riders and make mistakes that cause a crash. Drunk drivers. It is against the law to drive with a blood alcohol content of 0.08% or higher. However, even at lower levels alcohol can impair the judgment of a driver and the driver can cause a serious crash. Poor road design or road conditions. Potholes, excessive foliage, or slippery roads can make it difficult for drivers and can make crashes more likely. If you have been hurt or if you have lost a loved one in any Illinois motorcycle accident caused by someone else’s negligence, then it is important to fight for your fair recovery. Medical expenses. This includes all health-related expenses such as surgeries, hospital stays, medications, assistive medical devices and rehabilitation therapies. Lost income. Any income—whether partial or total—may be recovered. Out-of-pocket costs. This includes funeral costs if your loved one died, and any other costs you incurred as a result of the accident. Pain and suffering. Your emotional pain and physical suffering can’t be undone by a financial settlement, but you still deserve compensation for these significant injuries. You deserve to recover these damages, but you will have to right for them. How to collect evidence at the scene of the accident. Pictures, witness statements, and other things may be important in determining what caused your accident and who is responsible for paying your damages. How a settlement works. Settlements require negotiations with the insurance company. It is important to know what should be in your demand letter, what to tell the insurance company, and how to negotiate your fair recovery. How long you have to file a case. The Illinois statute of limitations typically provides you with two years to file a claim; however, there are exceptions to this general rule. Whether you have standing to sue. If you’ve been hurt, or if you are the personal representative of the estate of someone who died in the crash, then you may have the legal authority to bring a lawsuit. Whether your own actions may impact your recovery. Illinois comparative negligence rules allow you to recover damages even if you were partly at fault for the crash—as long as you did not cause 50% or more of the crash. Whether you need expert witnesses. Expert witnesses may help establish what happened in the accident, whether the accident caused your injuries, and the future value of your damages. It is also important to know whether you need an attorney. An attorney can make sure that all of your rights are protected and fight hard to get you the recovery that you deserve. How insurance impacts your recovery. The amount of insurance that the other driver had—or didn’t have—and even your own insurance could be relevant to the damages you are able to recover. Illinois motorcycle laws. It is important to understand what Illinois law requires of riders and other drivers. How to get a copy of your police report. Since you were injured, the police should respond to your accident scene and issue a report. It is important to get a copy of this report and to share it with your lawyer. How to deal with insurance adjusters. Insurance adjusters are doing their jobs well when they try to get you to accept the lowest possible settlement for your injuries. Accordingly, it is important to know how to negotiate with them. The things that you should not do after a crash. Certain mistakes could put your recovery in peril. By understanding these mistakes, you may be able to avoid them and protect your rights. That there is often a bias against riders. Insurance adjusters, juries, and even some police officers may believe that riders are often at fault for crashes. You will need to overcome this bias in order to get a fair recovery for your injuries. These tips can help you with a successful claim, but it is also important to know that you are not alone. We represent injured riders and we work hard to make sure other motorcyclists never know the pain that you are going through. You can join us in this effort by requesting your free watch for motorcycles sticker to adhere to your bike or other vehicle. You can also join us in our support of Illinois A.B.A.T.E. and other local riders’ groups. Together, we can make a difference for you and for riders in our community. Please contact us today via this website or at 1-800-800-5678 to schedule a free consultation to discuss your motorcycle accident case and potential recovery. MotoAmerica at Road America Melissa Juranitch interviews Superstock 600 Racer Bryce Prince of Tuned Racing at the MotoAmerica Honda Superbike Showdown at Road America. 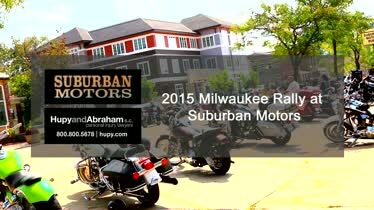 Milwaukee Rally 2015 - Suburban Motors www.hupy.com Many riders gathered at Suburban Motors over the weekend of the 2015 Milwaukee Rally. 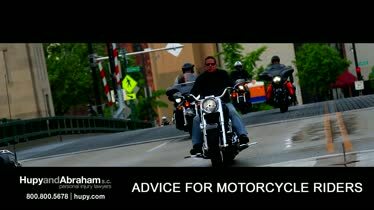 Milwaukee Rally 2015 - Watch for Motorcycles Hupy and Abraham, S.C. is proud to help spread the Watch for Motorcycles message through stickers, t-shirts, billboards, newsletters and other materials. 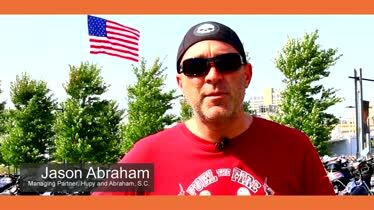 Hupy and Abraham, S.C. - Advice for Motorcycle Riders Drivers are not always aware of their surroundings and may not be watching for motorcycles while driving.